Two-time Academy Award winner Kevin Spacey announced today that he’ll be taking an “indefinite” break from acting. This announcement comes in the midst of a career tailspin for the veteran actor, who was fired from “House of Cards” and had several film projects shelved after accusations of sexual assault and misconduct went public. Spacey had begun training to be a Catholic priest in 1995 as part of his method acting research for the movie “Se7en”. Father Colin Martinque, a senior instructor at Sweet Valley Seminary, believes that a life of ecclesiastical humility is just what the troubled actor needs to redeem himself. Spacey’s work ethic as an actor has already propelled him to the top of his class. 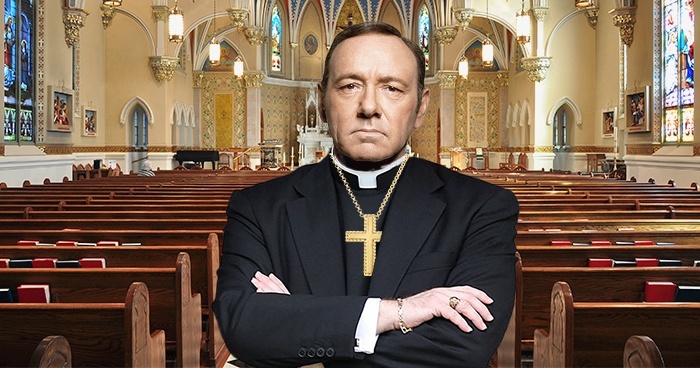 According to Spacey, rising in the ranks in the Church is the farthest thing from his mind.